Our many wounded sat in the Vietnamese mud or sprawled out on ponchos. Medical attention was urgently needed to prevent them from going into shock or bleeding to death. The few remaining medics had to make difficult decisions about who they would care for next. 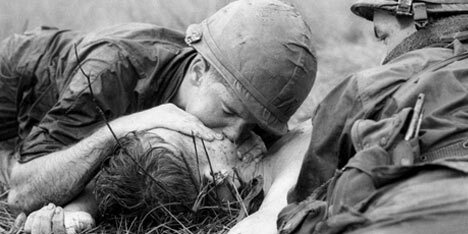 Which man needed medical help the worst, the man missing a leg, the man with his intestines piled in an obscene mess in his lap, the man bleeding from a gunshot wound to the chest, the man with his face blown away by shrapnel, or one of the other men broken and bleeding? There were more than 150 of these life-and-death decisions facing the handful of medics as they tried to treat and prepare our wounded for evacuation by medevacs. Some of the attempts of saving the wounded were recorded by AP photographer Henri Huet, who was with us that day. He immortalized Medic James Callahan on film trying to resuscitate a dying soldier. Medic Mike Stout from Oklahoma is also visible in another of Huet’s photographs, as Callahan and Stout attempted to save a young wounded soldier. You can see the desperation and helplessness on Callahan’s face as he looks up with sadness and loss, knowing he must move on to his next wounded comrade. There is no time to mourn for the dead. I knew Callahan. He traveled with our command group, and since he was a damn Yankee from Pittsfield, Massachusetts, we had things in common to talk about. I was another Yankee from Charlestown, New Hampshire, about a hundred miles away from Callahan’s hometown. He was one of the few men I connected with while serving with the Black Lions Alpha Company. He and Medic Stout were two of our real heroes. They tried to save men while bullets cracked about them. They were able to comfort and save most of the wounded men they worked on. Luckily, they were not the only two medics left. Medic Felix Vallejo was another medic who tried to mend the broken. These medics would see and remember some of the most horrific visions of what war is all about. They would remember the glassy, wide-open eyes of the dead staring up at them and the eerie silence of the dead after they gulped their last breath of smoke filled muggy air. They would remember those vacant faces staring up at them forever. War is about killing, spilling another man’s blood, snuffing out life, stealing a man’s future, terrorizing, the grotesque maiming of men, reducing men to snarling bloodthirsty animals or cowering defeated wrecks of mankind. The shared horrors these medics had seared into their brains might explain why Mike Stout of Glencoe, Oklahoma, and James Callahan of Pittsfield, Massachusetts stayed friends until they both died years later. In fact, James Callahan was on his way to see his dying colleague Mike Stout on July 29, 2008, when he was killed in a motorcycle accident. His daughter Cheryl, a Pittsfield police officer, was one of the first to answer the emergency call and arrived at the scene of her dead father. Six days later, on August 4, 2008, Mike followed his buddy James out of this world. Wherever the other side is, I bet they both are enjoying each others’ company.